The Roots are Strong – Save A Woman – Save The World! My Aunt Ann had a massive stroke over the weekend and they don’t expect her to survive the weekend. And honestly – I’m not sure that she would want to. She would consider it to be undignified and bothersome but she would do it in a way that would make it sound positive and uplifting, for she had that gift. My Aunt Ann was the quiet voice of wisdom in the darkest of times and words she spoke to comfort or advise or console were always the exact right thing to say. These words were often repeated later as the true value and depth of their meaning sometimes took a while to sink in. 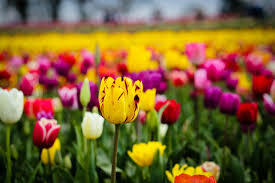 When my sister and her husband had suffered a devastating loss and was sitting in silence on her front porch, my Aunt told her a story about the tulips that graced the flowerbed around the house as if it were a passing thought with no reference to their current state of hopeless abandonment. I come from a family of farmers and gardeners and although I do not possess the coveted green thumb, I always thought that it was the keepers of the ground that truly understand hope and patience. There is no immediate gratification in farming or gardening…it is a labor of love and patience and understanding that a tiny seed that in itself promises nothing, will someday overcome all odds and become a thing of beauty or nourishment for others to enjoy. Tulip bulbs are planted deep in the ground in the fall but don’t make their glorious appearance until after Springtime. This is a labor of Hope for the Gardener as one never knows what their future will be until the time is right. The Ground gets very dry and cold and hard and the snow covers the ground they wait in for many months. My Aunt had planted these bulbs – as she had done for as many years as I can remember in full expectation that they would become a thing of beauty for an entire Summer. That year had been a very cold winter. Unusually cold – even for the Midwest. It has run longer than usual and she had feared that the tiny plants that had barely peeked their stalks out from the ground before a last frost late came unexpectedly and froze them solid. Too cold, my Aunt had imagined for the Tulips to have any hope of living through it and blooming as they usually did every spring. For a few weeks each morning as she left for her job as an editor of a small community newspaper, she observed the barren ground, disappointed, but not her faith not shaken that all the work she had done to plant these flowers would go unrewarded. And sure enough, one morning when the sun had warmed the ground and everything around it, she saw that the tulips would not only live, but that they would be the most beautiful and strongest flowers she had ever had. I would like to always remember the strength and patience and hope that my Aunt Ann always gave away so freely. She was a great woman who was one of the first in my family history to go to college, marry and work a full time job while raising a family and was a leader in her small community. She went to church every Sunday at the picture book Country Baptist Church in town that had a maximum capacity of about 100. Many years after she and her husband sold their interests in the lumber yard that supplied many of the surrounding communities with building materials, she supported my Uncle Don in his bid to become the County Sheriff. She used Oil of Olay every morning and evening and ironed her sheets before making the beds in her house that you could bounce a quarter off. Her house was always spotlessly clean and she had the same phone number for over 60 years and never got a cell phone. She dressed as if she were going to church every day, complete with hair and make up done with care and precision. She had a musical laugh and a smile that lit up a room. Her doors were always open and she had a heart of solid gold.